Vasculogenesis and angiogenesis are of physiological and pathological importance during the process of development. In this study we address that FGF10 affects both vasculogenesis and angiogenesis in vitro and in vivo. Evidence indicates FGF10 does not alter the proliferation of HUVECs in vitro, but FGF10 stimulates HUVECs cultured on Matrigel to form capillary-like structures. In chick embryo chorioallantoic membrane assay, evidence shows FGF10 induces strong angiogenesis responses in vivo. Together, our studies provide novel insights into the functions of FGF10 during the formation of newborn blood vessels. There are two processes during vascular network formation, vasculogenesis and angiogenesis. Vasculogenesis describes the differentiation of endothelial precursor cells from mesoderm and their colescence into tubes of central axial vessels, whereas angiogenesis is the subsequent sprouting, bridging and branching from pre-existing vessels [1,2]. Fibroblast growth factors (FGFs) play an important role in vessel formation as a stimulatory regulator [3-5]. Of these, the most important and frequently being studied member in angiogenesis and vasculogenesis is FGF-2. Studies indicate that FGF-2 exerts a vital role in vascular responses by increasing EC proliferation and stimulating migration, and is critical for vascular development and angiogenesis [6,7]. However, roles of other FGFs are not well studied as FGF2. There are 7 subfamilies of FGFs in vertebrates, which signal through FGF receptors 1-4 (FGFRs 1-4) . FGF10 belongs to the FGF7 subfamily whose receptors are FGFR1 and FGFR2 [8,9]. Studies show that that FGF10 deriving from the ventral hypothalamus plays an important role in promoting endothelial outgrowth, and directs newborn vessels to the chick ventral hypothalamus. However these studies do not systematically interpret roles of FGF10 in vascularisation. Here, we report an investigation of angiogenic function of FGF10 using in vitro and in vivo assays. 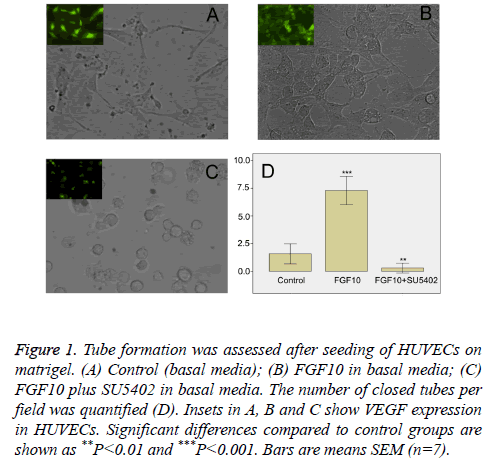 Although exogenous FGF10 itself does not appear to increase proliferation level of human umbilical vein endothelial cells (HUVECs) significantly, FGF10 stimulates HUVECs cultured on Matrigel to form capillary-like structures. Furthermore, FGF10 induced strong angiogenesis responses, causing new vessel formation in chick embryo chorioallantoic membrane (CAM). The negative effects of SU5402 in vessel outgrowth suggest that FGF10 is necessary for angiogenesis. Together,these studies reveal roles for FGF10, a member of FGF7 subfamily, during the process of vascularisation. Cells were seeded at a concentration of 1 × 105/ml, in 3 ml of basal medium in 6-well plates. After attachment (24 h), medium was replaced with serum poor medium (SPM), containing 1% FBS in which the cells grew at a significantly reduced rate. FGF10 protein (R&D, 100 ng/ml) or its antagonist SU5402 (GR161486-10 Abcam, 20 μM) was added and cells incubated for a further 1d, 3d or 5d. After 3 days culture, serum poor medium (SPM) will be changed with fresh SPM. After culture, cells were washed in PBS, detached in 0.05%w/v trypsin in PBS, and counted on a Coulter counter (Coulter Electronics) set to a threshold of 30 μm. Experiments were performed at least twice in triplicate wells. Matrigel was thawed on ice overnight, and spread evenly over each well (50 μl) of a 24-well plate. The plates were incubated for 30 mins at 37°C to allow Matrigel to gel, and HUVECs were seeded (2.5 × 104 cells/cm2) and cultured in basal medium containing FGF10 (100 ng/ml) or SU5402 (20 μM). Control wells were treated directly in basal medium. After 18 h of incubation at 37°C, cultures were photographed. Phased contrast images were recorded using a digital camera (Leica Imaging System) connected to an Olympus microscope. Seven random fields were selected and the number of closed tubes counted. Eggs of 5-day-old chick embryos were opened with a round window that allowed direct access to underlying chorioallantoic membrane (CAM). A filter paper disk saturated with FGF10 (100 ng/ml), SU5402 (20 μM) or an equal aliquot of PBS was applied to the top of CAM. After 72 hours of incubation, vessel growth was quantitated by imaging the CAM with a Spot camera (Nikon, Tokyo, Japan) mounted on an Olympus microscope (Olympus, Japan) linked to a Dell computer running Image Pro Plus 6. Vessels were analyzed and quantitated by using Image Pro Plus 6. Immunohistochemical analysis of HUVECs was performed according to standard whole-mount techniques . Antibody used was: anti-VEGF (Santa Cruz Biotechnology). Secondary antibodies were conjugated to Alexa 594 or Alexa 488 (Molecular Probes). Statistical analyses were carried out using SPSS19.0 for PC. Statistical significance of differences in means between groups was determined using a 2-tailed Student t test. P values less than or equal to 0.05 indicates a significant difference. To assess whether FGF10 could stimulate proliferation of endothelial cells, we culture HUVECs in basal medium with or without FGF10. Cell number will be counted after 1 d, 3 d, and 5 day’s cultivation. Quantitiative analyses revealed there is no significant difference between the number of cells cultured in the control groups and the FGF10 groups. This suggests that FGF10 is not a stimulator of HUVECs proliferation. However, addition of SU5402, a small molecule inhibitor that suppresses tyrosine kinase activity of FGF and vascular endothelial growth factor (VEGF) receptors , decreased cell growth significantly (P>0.05) (Table 1). This finding indicates the necessity of FGFs in the growth of blood vessels. Thus, unlike FGF2, FGF10 appears no apparent functions on the proliferation of HUVECs. SEM:Standard Error of the Mean;**p<0.01. Table 1. The number of HUVECs (mean ± SEM) are shown in each group. Statistical comparisons between groups (FGF10 or FGF +SU5402 groups versus blank control groups) are also shown. In order to determine whether FGF10 had an effect on vessel formation, we next performed in vitro vasculogenesis assay. Such assay is based on the principle that endothelial cells form tubule-like structures when cultured on a supportive matrix, and that this process can be enhanced by classical angiogenic factors [12,13]. After seeding on Matrigel, HUVECs in basal media spread and start to align with each other, giving rise to short sparse tubule like structures within 18 h (data not shown). In contrast to control groups (Figure 1A), in the presence of FGF10 (100 ng/ml), VEGF positive HUVECs formed a rich meshwork of branching capillary-like tubules with multicentric junctions after cultivation of 18 hours (Figure 1B). When FGF10 was administered in the presence of SU5402 (20 μM), the capillary-like tubes were interrupted, and most cells were spherical, either isolated or aggregated in small clumps (Figure 1C). Image analysis showed that, in comparison with control groups, FGF10 markedly increased the number of tubule-like structures of the capillary-like meshwork (Figure 1D). However, the effect of FGF10 can be significantly counteracted by SU5402 (Figure 1D). Thus, in this study, FGF10 shows an effect on vasculogenesis, inducing more de novo formation of vessels via the branching of endothelial cells. Figure 1: Tube formation was assessed after seeding of HUVECs on matrigel. (A) Control (basal media); (B) FGF10 in basal media; (C) FGF10 plus SU5402 in basal media. The number of closed tubes per field was quantified (D). Insets in A, B and C show VEGF expression in HUVECs. Significant differences compared to control groups are shown as **P<0.01 and ***P<0.001. Bars are means SEM (n=7). 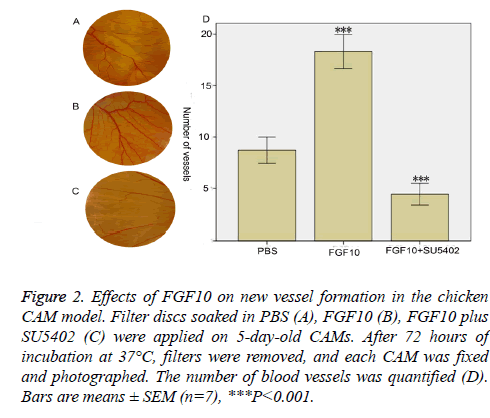 To further test the effects of FGF10 on angiogenesis, we extended these studies by using the classic model of angiogenesis on the chicken CAM in vivo. CAM is an extraembryonic membrane with a dense capillary network, and thus has been commonly used in vivo to study the angiogenesis . Filter discs soaked with (100 ng/ml) FGF10 in the presence or absence SU5402 (20 μM) were placed on 5-dayold CAM. After 72 hours, each CAM was fixed and photographed (Figure 2). Greater new vessel growth was observed in the presence of FGF10 than vessel growth in PBS control groups (Figures 2A and 2B). Growth of new vessels was also quantitated by the number of vessels (Figure 2D). In contrast to vessel growth in PBS groups, there is a significantly greater vessel growth in the presence of FGF10 (P<0.001) (Figure 2D). SU5402 block the new vessel growth which is triggered by FGF10: much less vessel growth was observed in the presence of SU5402 in comparison with PBS groups (Figures 2C and 2D). Figure 2: Effects of FGF10 on new vessel formation in the chicken CAM model. Filter discs soaked in PBS (A), FGF10 (B), FGF10 plus SU5402 (C) were applied on 5-day-old CAMs. After 72 hours of incubation at 37°C, filters were removed, and each CAM was fixed and photographed. The number of blood vessels was quantified (D). Bars are means ± SEM (n=7), ***P<0.001. FGF10 is a paracrine-signaling molecule that has import roles during embryonic development . Our studies have provided novel insights into the functions of FGF10 during the formation of blood vessels. The findings presented demonstrate the roles of FGF10 for formation of vascular structures. FGF10 has an effect on the proliferation of HUVECs, but this effect is not as apparent as FGF2, consists with previous data that FGF10 can exert a direct effect on endothelial cells, but this role is weak . In spite of endothelial cell proliferation, we show for the first time that FGF10 promotes newborn-vessel formation in two assays, the vasculogenesis analysis of tube formation in Matrigel in vitro and the angiogenesis analysis in the chick-embryonic CAM in vivo. Thus, our results show, FGF10 related vascularisation is driven by both vasculogenesis (the de novo formation of vessels via the assembly of HUVECs) and angiogenesis (vessel formation via sprouting of pre-existing blood vessels in CAM). Previous studies show that FGF10 also elongates the outgrowth of hypothalamic axons, and directs axons to their final targets . Recently, studies suggest a common mechanism for axonal and vascular growth; many axon guidance cues instruct vascular patterning, and vice versa. In the vascular system, the distal tip of the developing capillaries is composed of ‘tip cells’, which are similar to axonal growth cones [3,16]. Numerous filopodia can also be detected at the end of the tip cells, suggesting that they direct the migration of newborn vessels [3,16]. The anatomical similarity between the axonal growth cone and the vascular tip cells, and the similar pathways taken by axons and vessels add more evidence to this theory that axon guidance cues also function as vascular cues. For instance, Netrin-1, a conserved axon guidance cue, has been shown to be a potent vascular mitogen that stimulates proliferation and migration of vascular endothelial cells and smooth muscle cells [17,18]. Consistent with this theory, in this study, we have demonstrated that FGF10, besides its effects as an axon guidance cue, also has additional functions in vaculogenesis and angiogenesis. Three transduction pathways are activated by FGFs: the RASMAP kinase pathway, the PI3 kinase pathway and the PLC • pathway . There is a hypothesis that FGFRs preferentially activate distinct signaling pathways resulting in different effects of FGFs. Moreover, recent studies show that there are additional signaling pathways in transmitting FGF signaling in vascularisation [4,20]. Thus, it is conceivable that FGF10 also preferentially activate distinct signaling pathways resulting in distinct effects. Next, a further investigation of FGF signaling may shed light on the mechanism of FGF10 on vascularisation. This work was supported by National Nature Science Foundation of China (31460259). Risau W. Mechanisms of angiogenesis. Nature 1997; 386: 671-674. Eichmann A, Le Noble F, Autiero M, Carmeliet P. Guidance of vascular and neural network formation. Curr Opinion Neurobiol 2005; 15: 108-115. Carmeliet P, Tessier-Lavigne M. Common mechanisms of nerve and blood vessel wiring. Nature 2005; 436: 193-200. Murakami M, Simons M. Fibroblast growth factor regulation of neovascularization. Current Opinion Hematol 2008; 15: 215-220. Yang X, Liaw L, Prudovsky I, Brooks PC, Vary C, Oxburgh L. Fibroblast growth factor signaling in the vasculature. Current Atheroscler Rep 2015; 17: 509. Klein S, Roghani M, Rifkin DB. Fibroblast growth factors as angiogenesis factors: new insights into their mechanism of action. EXS 1997; 79: 159-192. Nissen LJ, Cao R, Hedlund EM, Wang Z, Zhao X, Wetterskog D. Angiogenic factors FGF2 and PDGF-BB synergistically promote murine tumor neovascularization and metastasis. J Clin Investigation 2007; 117: 2766-2777. Mason I. Initiation to end point: the multiple roles of fibroblast growth factors in neural development. Nat Rev Neurosci 2007; 8: 583-596. Zhang X, Ibrahimi OA, Olsen SK, Umemori H, Mohammadi M, Ornitz DM. Receptor specificity of the fibroblast growth factor family. The complete mammalian FGF family. J BiolChem 2006; 281: 15694-15700. Liu F, Pogoda HM, Pearson CA, Ohyama K, Lohr H, Hammerschmidt M. Direct and indirect roles of Fgf3 and Fgf10 in innervation and vascularisation of the vertebrate hypothalamic neurohypophysis. Development 2013; 140: 1111-1122. Mohammadi M, McMahon G, Sun L, Tang C, Hirth P, Yeh BK. Structures of the tyrosine kinase domain of fibroblast growth factor receptor in complex with inhibitors. Science 1997; 276: 955-960. Lamszus K, Schmidt NO, Ergun S, Westphal M. Isolation and culture of human neuromicrovascular endothelial cells for the study of angiogenesis in vitro. J Neurosci Res 1999; 55: 370-381. Donovan D, Brown NJ, Bishop ET, Lewis CE. Comparison of three in vitro human 'angiogenesis' assays with capillaries formed in vivo. Angiogenesis 2001; 4: 113-121. Ribatti D. Chick embryo chorioallantoic membrane as a useful tool to study angiogenesis. Int Rev Cell MolBiol 2008; 270: 181-224. Itoh N, Ohta H. Fgf10: a paracrine-signaling molecule in development, disease, and regenerative medicine. Current Mol Med 2014; 14: 504-509. Eichmann A, Thomas JL. Molecular parallels between neural and vascular development. Cold Spring HarborPerspect Med 2013; 3: a006551. Park KW, Crouse D, Lee M, Karnik SK, Sorensen LK, Murphy KJ. The axonal attractant Netrin-1 is an angiogenic factor. Proceed Nat AcadSci USA 2004; 101: 16210-16215. Wilson BD, Ii M, Park KW, Suli A, Sorensen LK, Larrieu-Lahargue F. Netrins promote developmental and therapeutic angiogenesis. Science 2006; 313: 640-644. Esser JS, Rahner S, Deckler M, Bode C, Patterson C, Moser M. Fibroblast growth factor signaling pathway in endothelial cells is activated by BMPER to promote angiogenesis. Arterioscler Thrombosis VasculBiol 2015; 35: 358-367. Brewer JR, Mazot P, Soriano P. Genetic insights into the mechanisms of Fgfsignaling. Genes Develop 2016; 30: 751-771.